The key to Pixar’s relative dominance over the animation genre lies, I think, in their thematic simplicity and honesty. I could not recount for you much of what happens on a plot level in Brave, but I could immediately tell you that it was, thematically, about the unique bond and conflict that exists between mother and daughter. The storyline of Wall-E may have lost some of its strength once we got onboard the Axiom, but it’s hard to forget the movie’s conviction that to stop taking responsibility for ourselves and our environment is to lose sight of much of what makes us human. These are simple themes in the most complimentary sense of the word: they are universal. If Pixar has occasionally released a lesser film that had a wobblier grasp on its theme, they’ve never lost track of their storytelling honesty. Given this, it seems appropriate that Inside Out, Pixar’s first original in three years and unquestionably one of the very best films the studio has ever produced, is about emotions and memory on a narrative level. Thematically, it’s a whole different stew; we could ponder some of the implications and assumptions evident in the movie’s story for a long time, but it would not do to sidestep a story that’s rendered with complexity and clarity. This is a tremendously exciting and moving piece of cinema, beautifully animated and deeply felt. If all you require is some assessment of the movie’s quality, you may stop reading and go to the theater’s ticket counter now. Much of the delight involves the slow unpacking of story and how it affects the characters, so I shan’t be spoiling anything. From the trailers, you already know this much: the main characters of Inside Out are a group of emotions inside the mind of an 11-year-old girl named Riley. 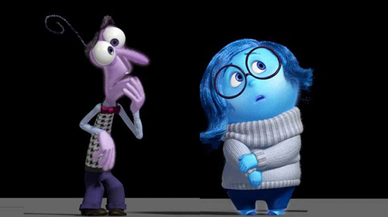 They are Joy (Amy Poehler), Sadness (Phyllis Smith), Anger (Lewis Black), Fear (Bill Hader), and Disgust (Mindy Kaling). These five represent shifting emotional states, and are responsible for the acquisition and storage of memories (little glass spheres, color-coded to each emotion. I will go no further, except to observe that I was already fairly well into the movie’s pocket by the time its prologue - containing a gloriously succinct and light visualization of birth - gave way to the opening credits. From here, it’s one vivid set piece after another, expressed with a palpable and heady confidence and clarity of vision. Consider the different landscapes of Riley’s emotional states, ingenious in their rendering as an endless labyrinth of corridors, each containing an uncountable number of memories - or a mid-film sequence where two emotions find themselves being expressed in continuously changing versions of abstract thought. You can consider the simple effectiveness of the movie’s visuals, and how Pixar has finally outdone themselves after the flawless imagery and movement in Wall-E. The characters in Inside Out do not look “real” in a photographic sense, but they are perfectly realistic within the movie’s universe, and director Pete Docter (of 2009’s Up) has the right touch for the material.